In last week’s post I introduced you to animal-faced masks that are probably used interchangeably between the Xantolos celebration during Todos Santos (All Saints/ All Souls) and the celebration of Carnaval (Mardi Gras). Here are some more of these animal Xantolo masks. As you will see, some were designated at the time of collection as Xantolo (or Chantolo) masks, while others were said to have been danced in Carnaval. The first two represent goats or rams. 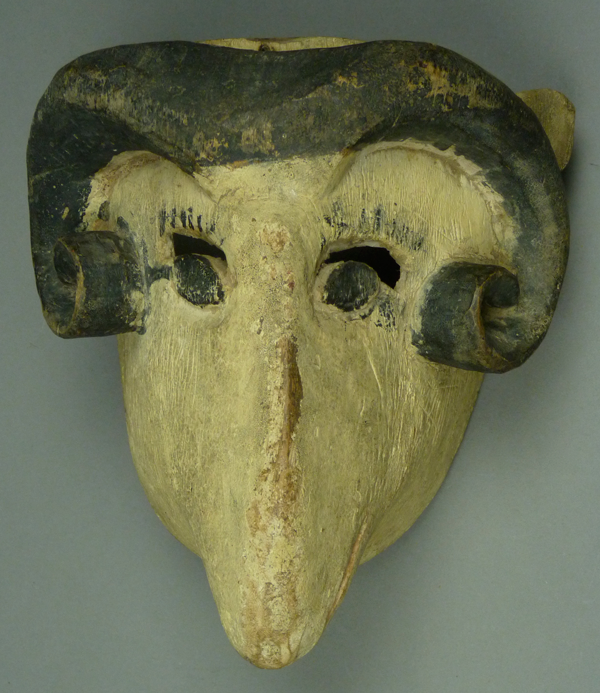 I bought this ram mask from Jaled Muyaes and Estela Ogazón in 1997. 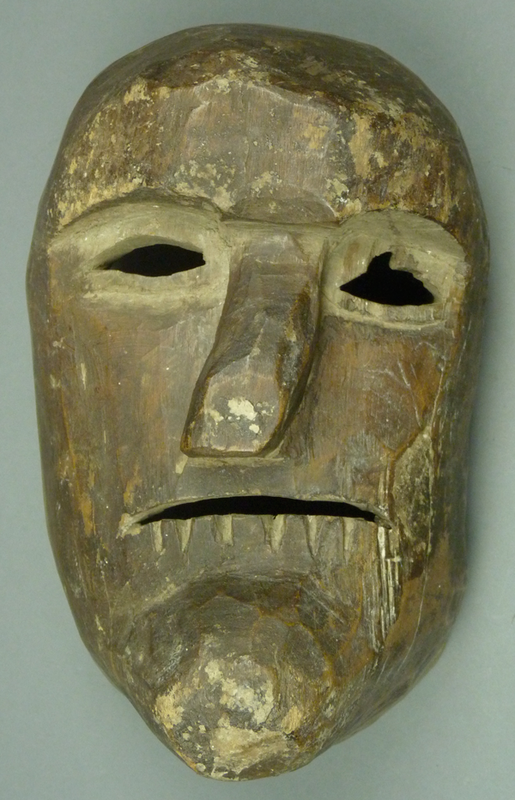 It was identified as a Xantolo mask from Zoquicualuya, in the Municipio of Huazalingo, Hidalgo. 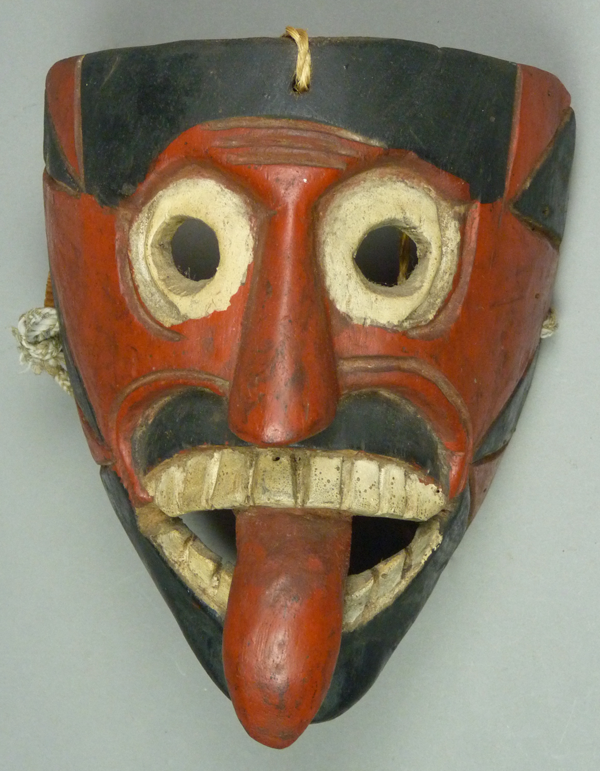 This is a dramatic mask, with the curling horns carved in high relief. The paint is cracked with age. In the course of collecting Xantolo masks, I found a number from towns in the Huasteca of Hidalgo and Veracruz that depicted animals or birds. Other similar masks were labeled as ones for Carnaval (Carnival or Mardi Gras). I am guessing that these masks might have been made for Carnaval and then used for the Xantolo performance. In Mask Arts of Mexico (Lechuga and Sayer 1994, page 55, plate 71) we find a mask with the form of a fish, which the authors report was “worn by Nahua performers during Carnaval and Day of the Dead ceremonies.” Today I will show you some of these masks, whether marked by one label or the other. I will start off with a group that are obviously all by the same anonymous hand as the Fish mask just mentioned. The first, with the Xipe Totec form, was clearly a Xantolo mask, while the rest are animals and birds. As you can see, this mask has all of the usual elements of the Xipe Totec style Xantolo masks, with the addition of an extended tongue. I bought this mask from Robin and Barbara Cleaver in the late 1980s. Such masks came from towns in the Municipios of Atlapexco and Huejutla de Reyes, Hidalgo. This last group of human faced Xantolos features masks notable for primitive elegance. I will begin with masks that were stained rather than painted. The first is a primitive masterpiece. It is labeled a Huehue/ Xantolo, from Piedras el Avaro, in the Municipio of Tantoyuca, Veracruz. I got this mask from Jaled Muyaes and Estela Ogazón in 1998. This mask continues the theme of the dead wearing flabby, formless faces. 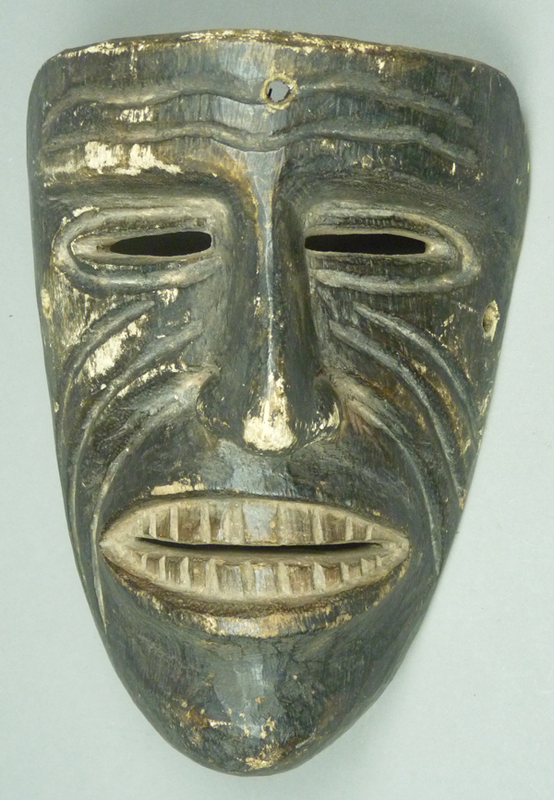 This week I will further illustrate the variety to be found in human-faced Xantolo masks from the Huasteca region of Hidalgo and Veracruz, beginning with three masks that are painted black. This one reminds me of the Xipe style masks, although it lacks those typical features. I bought this mask from Sergio Roman Rodriguez of Mexico City in 1997. This brooding, menacing mask would be highly effective on a dancer. With such eyes, the wearer would appear to be sleepwalking.